As an inventor and an avid admirer of all things old (I’m part Historian Organizing Personality Style; part Visual) I was inspired to build my own jewelry organizer. As a professional organizer I love to find ways to “go vertical” with everything to maximize storage space. Here’s how it turned out and how I did it. The left side side is for wire earrings, the corner knobs hold long necklaces, and the long screws at the bottom hold everything else. If you own lots of long necklaces you could turn this on its side giving you more length at the bottom. My goal was to actually use it as a mirror so vertical worked out best for me. I added a pair of vintage clip-ons to the beaded chain because I simply love them and who wants to wear clip-ons!? You can add whatever makes you happy to your chain. You could even put a daily meditation there. 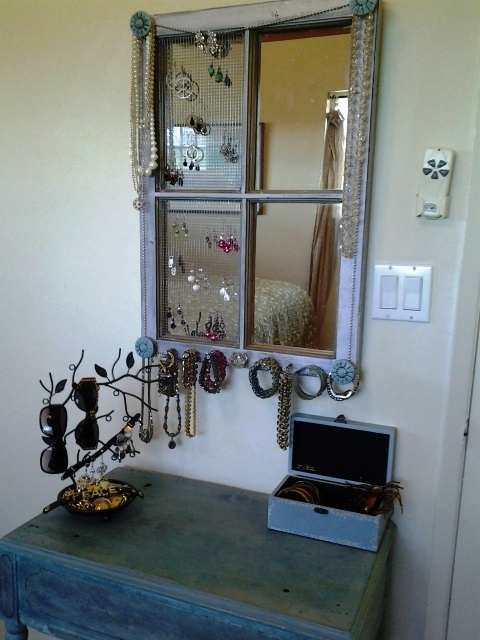 By keeping the mirror behind the frame I get a jewelry organizer and a mirror all in one. 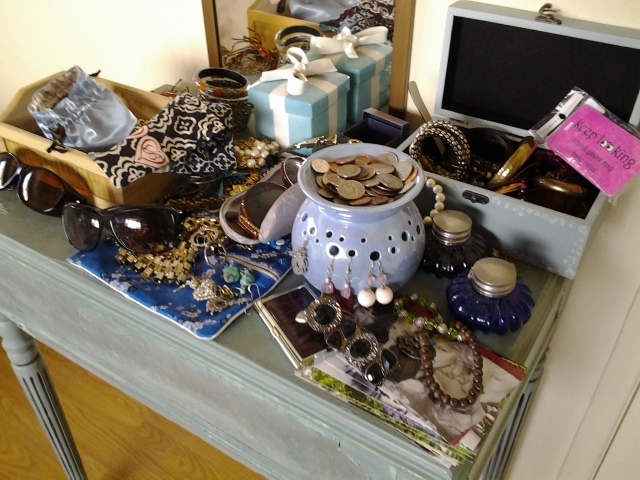 I had a small metal jewelry organizer tree from Michael’s and prefer it as my sunglasses holder. My heavy gold belt weighs it down otherwise it tips over! A Brat Strap with garter grips on both ends acts as a great holder for post earrings. Extra bangles and my orange spider hair clip are kept in a cute wooden box. Let’s see what I have here… I originally had this small vanity table here beneath a mirror. I kept most of the jewelry in a drawer. I bought everything out to get an idea of how much I had. 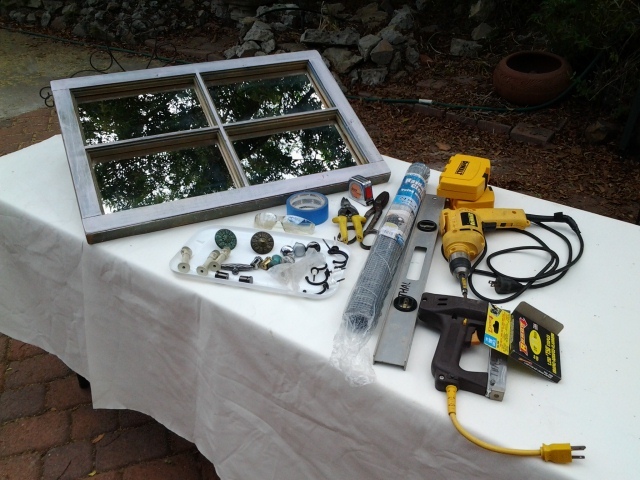 I like to lay everything out on a rectangular work table and assess my tools and supplies whenever I start a project. Mollies if your jewelry organizer is heavy and you’re going into drywall. I recommend locating at least one stud which is much safer. *Beaded chain and link attacher (like they used for lamps in old homes) just for decoration. Length depends on size of your frame. Small hammer, Phillips screwdriver, drill with driver tips and bits for long screws and mollies and pilot holes, wire snips, level, tape measure, pencil, safety glasses. 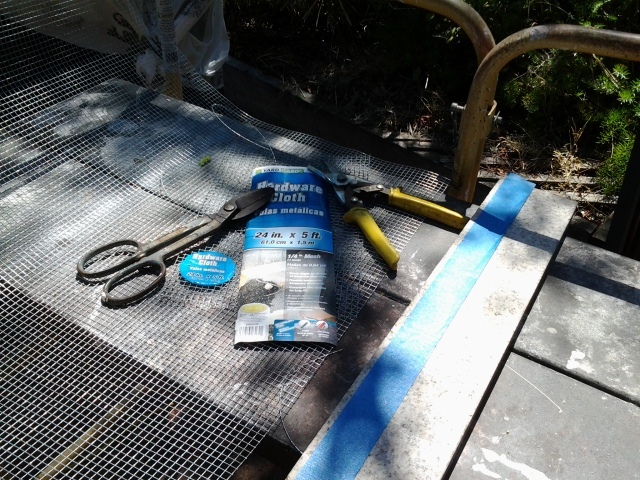 I did not use the staple gun because I could not get close enough to the frame rim with it. I did a sample on scrap wood first. So, I attached the pre-cut hardware cloth into each corner gently with a single staple on the diagonal with a small hammer and used scrap wood as the buffer when I hammered. Yikes — no broken mirrors, please! I used hardware cloth, yet I believe you could use chicken wire if you prefer that look. I cut it to size and laid it right into the frame grooves from the front. 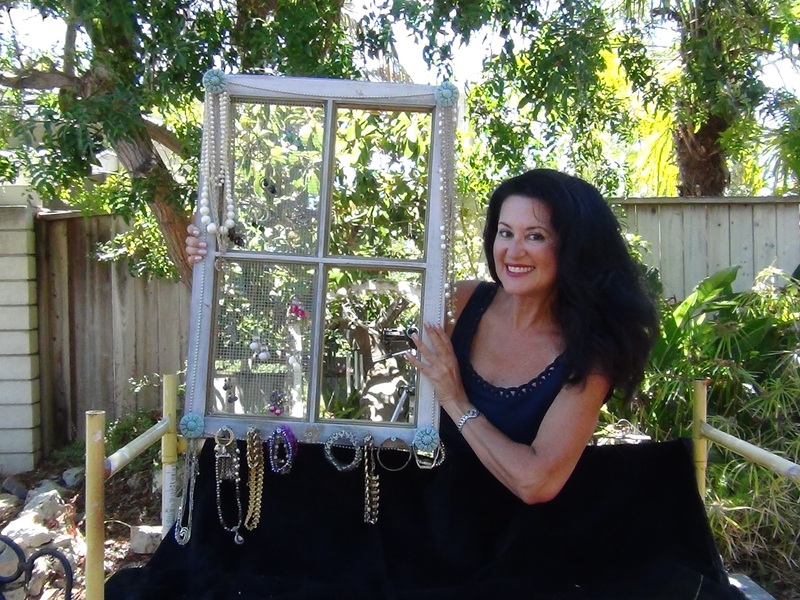 I began with an old framed mirror and chose to retain the mirror part, (rather than just use the frame) so I could still see my reflection when getting ready in the morning and selecting the jewelry for each day. 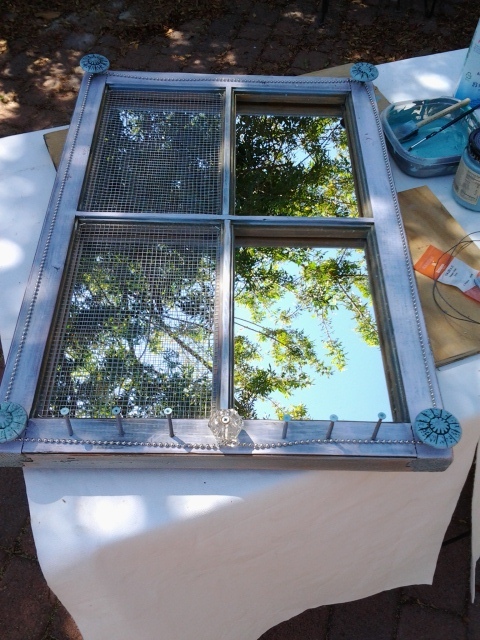 Over the years I’ve used that framed mirror to stage homes and decided it was time for me to get some fun use out of it. I bought the hardware cloth, beaded chain, screws, hanger bolts for the knobs at my local Ace Hardware. 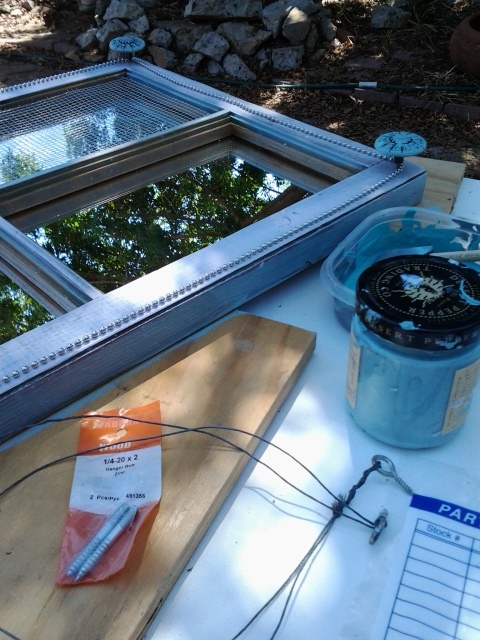 I already had the knobs and repainted them with my signature aqua color. Take the knobs with you to the hardware store because hanger bolts come in many different thicknesses and lengths. The staff at Ace is very helpful. I have been going there forever. Since owning old buildings in East Village and Bucktown in Chicago. Ace always had what I needed for 100-year old buildings. About Hanger Bolts: they’re used to attach knobs into wood. First insert the flat tip (machine screw end) into the knob; then pre-drill pencil marked pilot holes and hand screw the knob into the wood. I hope you enjoy your DIY Jewelry Organizer as much as I do. The “Visual” in me really adores it. Enjoy the process and make it your own. I have another pic of the finished product taken in the natural light below. It is pretty heavy with all that hardware, metal and jewelry on it now. It’s not that easy trying to take a picture of a mirror! 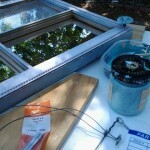 All sorts of things get reflected in the process. 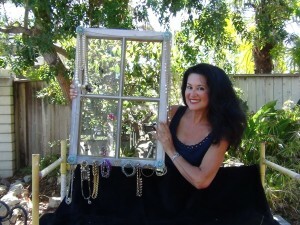 I know you’ll get great joy and satisfaction repurposing things to make them Organized Beautifully! I’d love to see pics of your project when you’re finished. And, feel free to contact me with any questions before you start your project. I brought the finished piece outside in an attempt to get a better photo. It is not easy shooting anything with a mirror as the subject!